Find your luck at 777 Casino, the new casino in our top list! Find your luck at 777! The new casino in our top list, 777 offer all of their new members a generous welcome offer! In order for you to feel extra welcome to casino 777, they give all new members who sign up to the site some extra bonuses. If you join now, they will give you 77 free spins, and no deposit is needed. All you need to do is to sign up, open the confirmation e-mail they’ll send you – and then start spinning. You can choose to use your free spins on four different slots – either Jacks Pot, Treasure Fair, Steampunk Nation or The Big Lebowski. 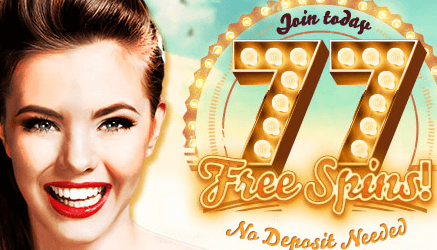 You will get access to your 77 free spins at once when you have registered, but the offer doesn’t end there! When you make your first deposit, use the code ‘WELCOME777’ and double it up to €200 FreePlay on the site!